First of all, it's worth to note that BOGO promo ("Buy one, get one") works a bit differently than similar promotions with other product quantity. If you don't know how to configure the promo 'Buy one product, get another one' in Special Promotions extension, please, check the steps below. The trick here is that we give 50% discount for a pair of products with the same price, so effectively we give one of the products for free. 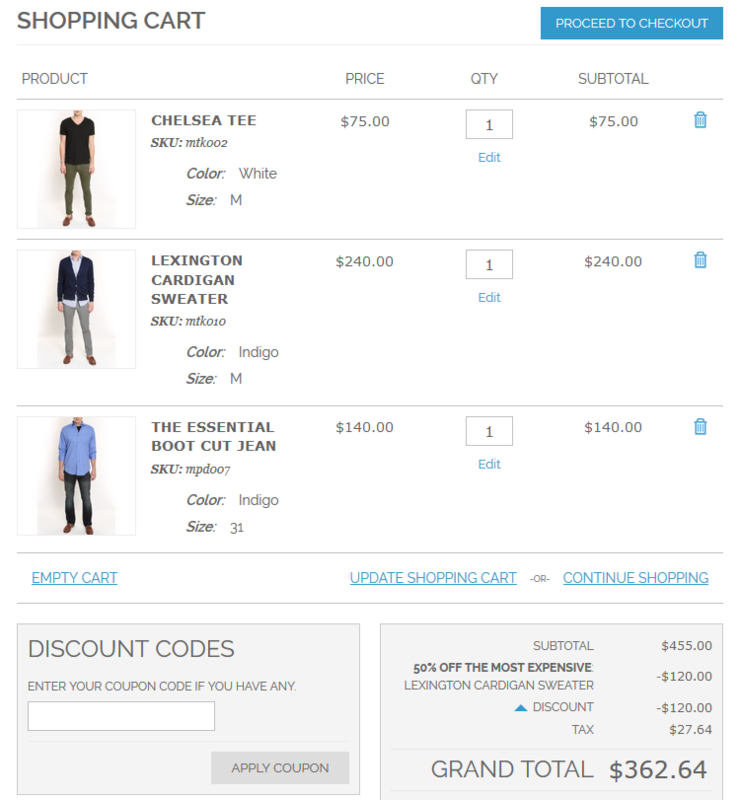 How to set up the promo 'Fixed amount discount for whole cart'? 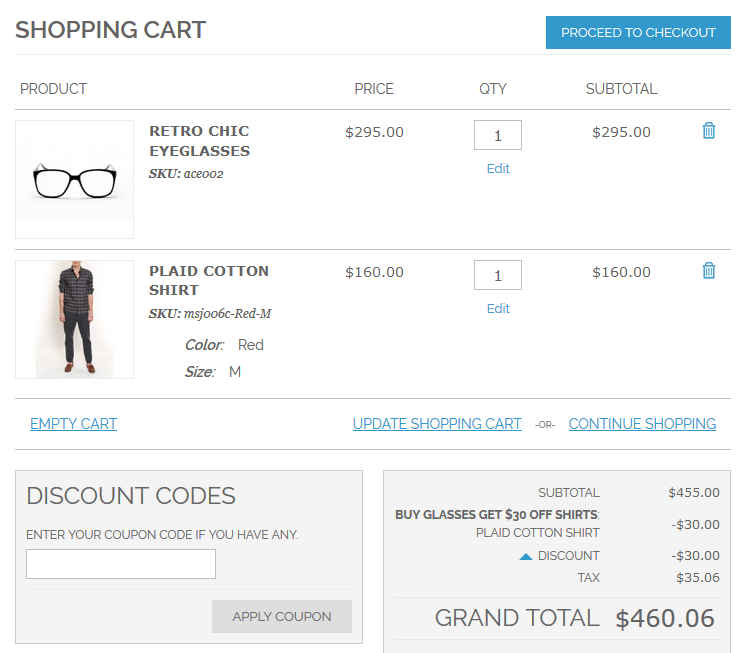 Actions: At the screenshot below you can see how to set up 10$ discount for the whole shopping cart. The guidance below explains how to set up the action ‘All products after N for Fixed Price’ of Special Promotions extension. With this action you can create promotions like ‘Buy 4 products for full price and get each additional product for $100’, or ‘Buy 5 shirts for full price and get each additional one for $20’. Let’s observe the steps of the action configuration. Please open Admin Panel > Promotions > Shopping Cart Price Rules (click ‘Add New Rule’ button) > Actions. Step 1. 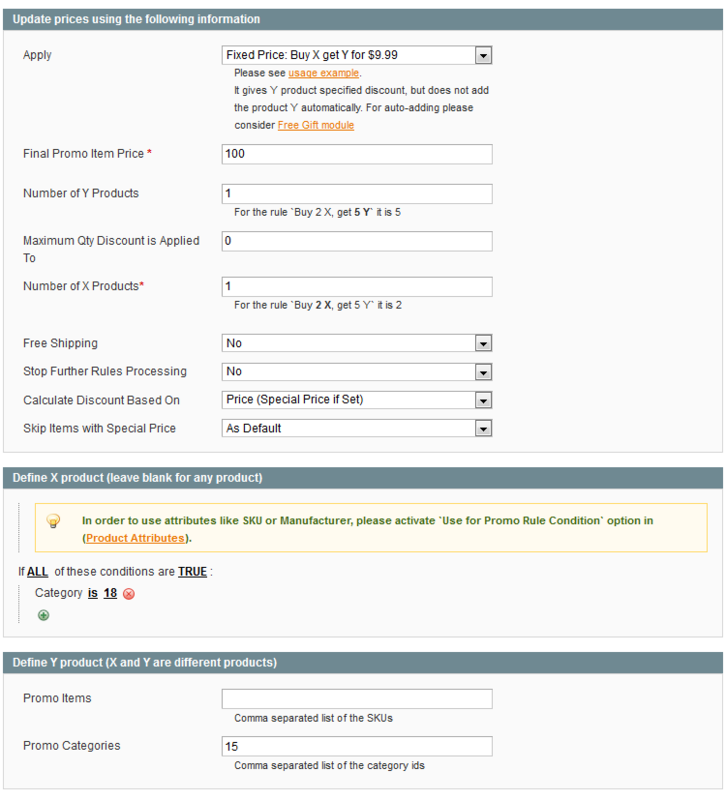 Choose ‘All products after N -- Fixed Price’ field. Step 2. Use ‘Discount Amount’ field to indicate the amount to which products ‘after N’ should be discounted. If you specify 100 like here, all products which exceed the ‘N’ number will cost 100 after the discount rule gets applied. Step 3. Please use ‘Maximum Qty Discount is Applied To’ to specify maximal number of items to which the discount should apply in one order. If you specify 3 like shown on the screenshot, it means that the customer will get not more than 3 products for the fixed price of $100. Step 4. Use ‘Discount Qty Step (Buy X)’ to specify the ‘N’ number. Here we specified ‘4’, which means that the customer will buy 4 most expensive products for full price and all additional products for the fixed price $100. Please look at the example of the rule we’ve created above. 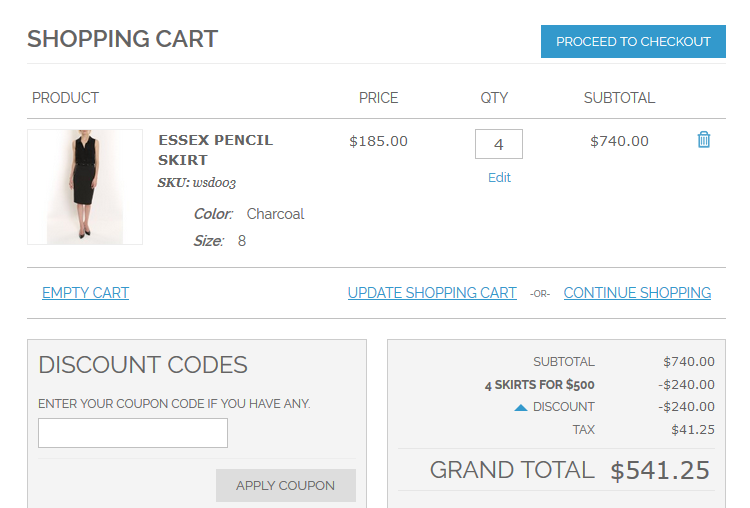 As you can see there are six items in the cart. Two cheapest items (Ottoman and BlackBerry 8100 Pearl) are for $100 according to the discount rule. The guidance below explains how to set up the action ‘All products after N with Fixed Discount’ of Special Promotions extension. All products after N with Discount’ action works on analogy with ‘All products after N for Fixed Price’. Only in this case customers get percent discount instead of fixed price. Step 1. 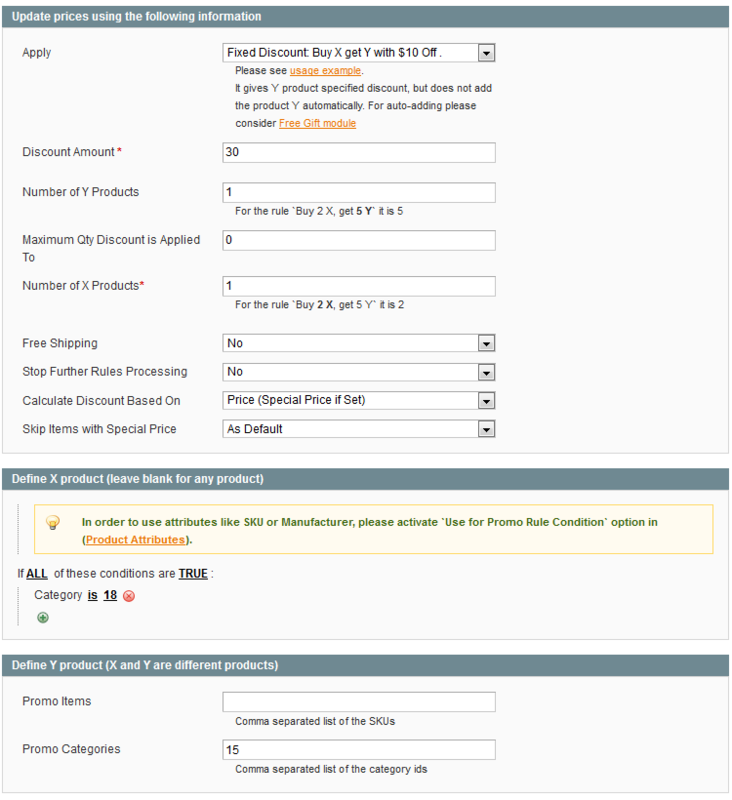 Choose ‘All products after N -- Fixed Discount’ field. Step 2. 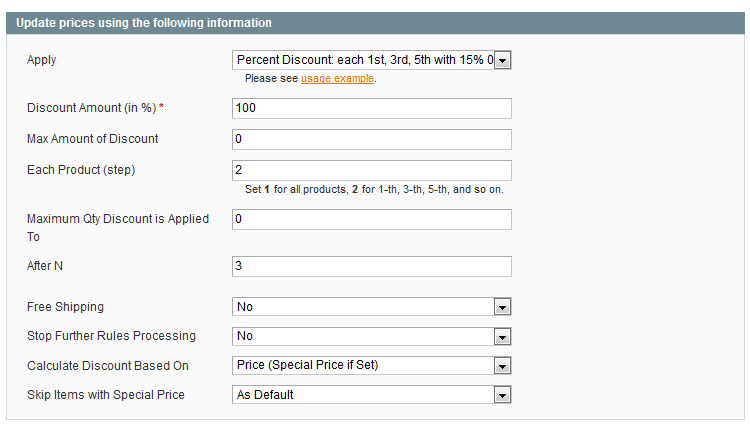 Use ‘Discount Amount’ field to indicate the discount percent. Step 3. Please use ‘Maximum Qty Discount is Applied To’ to specify maximal number of items to which the discount should apply in one order. Step 4. Use ‘Discount Qty Step (Buy X)’ setting to indicate the number of ‘X’ items. The guidance below explains how to set up the action ‘All products after N with Percent Discount’ of Special Promotions extension. Step 1. 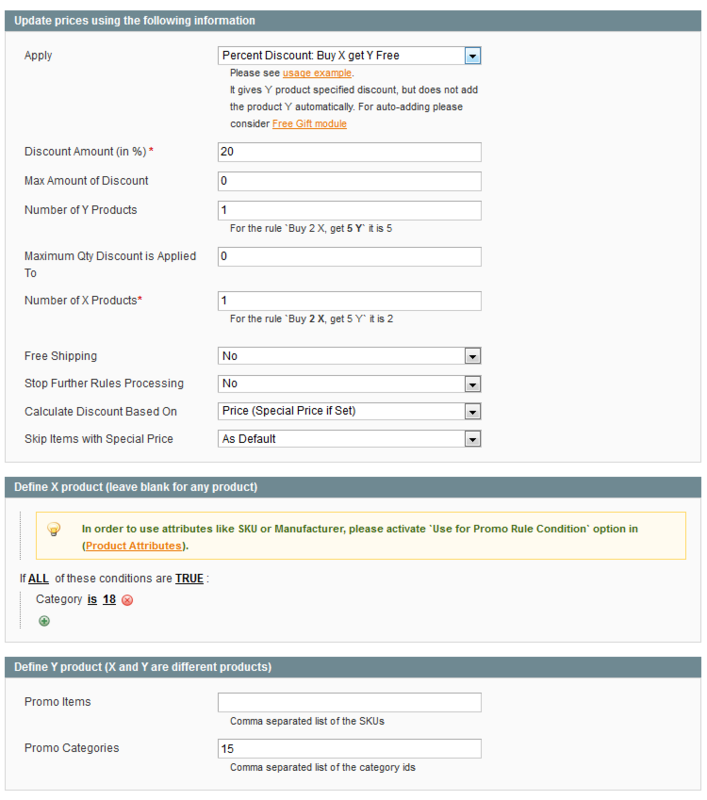 Choose ‘All products after N -- Percent Discount’ field. Step 4. Use ‘Discount Qty Step (Buy X)’ setting to indicate the number of ‘X’ items. With this setup customers would have to buy 3 items for the full price. They get 20% discount for additional items. The discount is limited to two items, so not more than 2 items will be discounted by 20%. The guidance below shows how to use the action ‘Fixed Discount: Buy X get Y with $10 Off ’ of Special Promotions extension. Thanks to this action you can create promotions like ‘Buy 3 phones and get 2 memory cards with $10 discount’. Step 1. Choose ‘Fixed Discount: Buy X get Y with $10 Off’ for the ‘Apply’ field. Step 2. 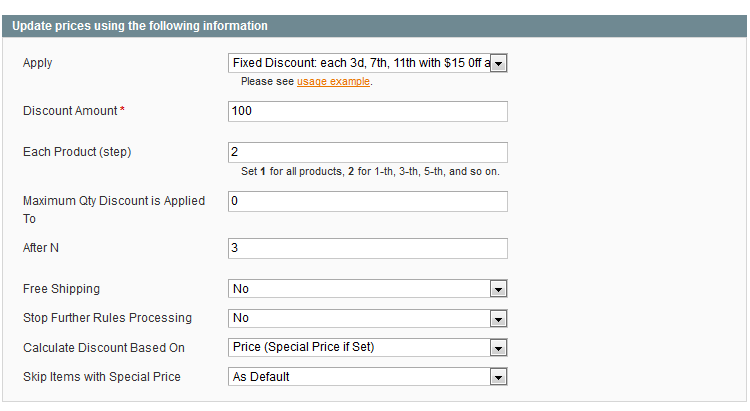 Use ‘Number of Y Products’ setting to indicate the number of ‘Y’ items which will receive a discount. Step 3. Use ‘Number of X Products’ setting to indicate the number of ‘X’ items. 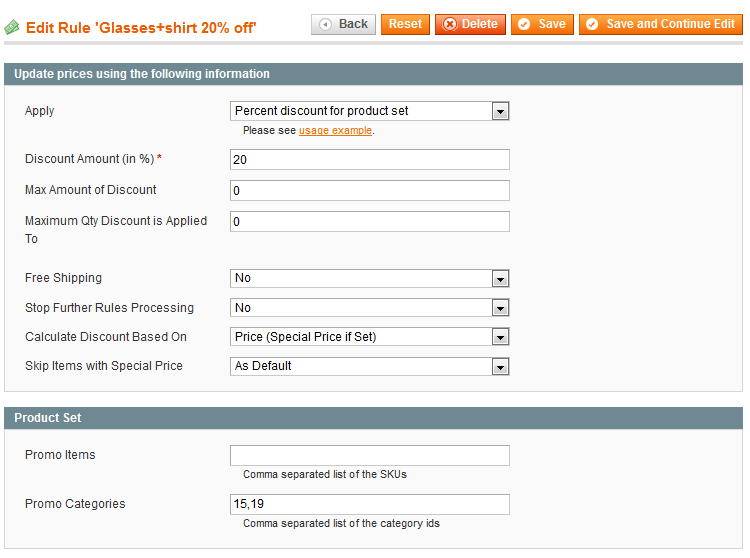 If you specify 1 like here, it means that a customer will have to buy 1 ‘X’ items to get 20% discount for one ‘Y’ item. Step 4. Use conditions section of the ‘Actions’ tab to specify ‘X’ items, by which the discount is triggered. In this case we indicated that ‘X’ items should be from category with ID 18 (Eyeglasses). Step 5. Use ‘Promo Categories’ field to indicate to which categories the discounted items (Y items) should belong. Step 6. 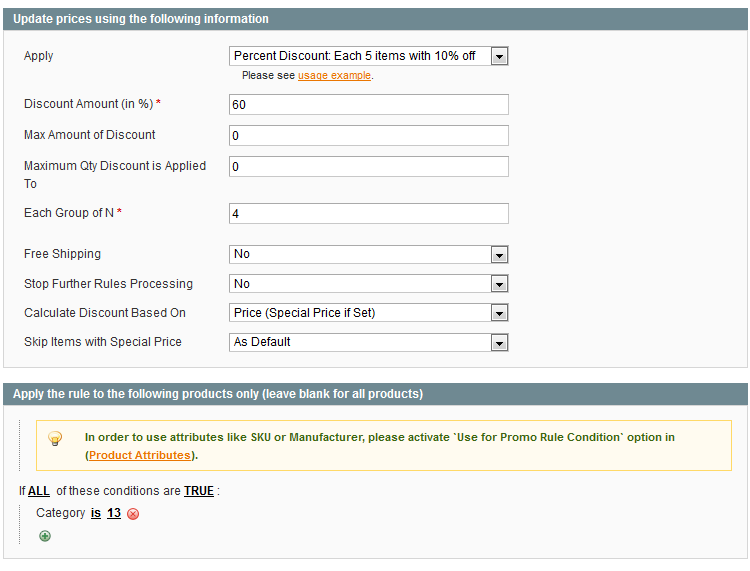 Also you can specify SKUs of the individual products to which the discount should apply (these are Y items as well). If you specify both categories and SKUs like here, the discount will apply to both individual items and to products from the categories. Please be aware that ‘X’ items and ‘Y’ items can’t be the same product. To enable the ‘Fixed Price: Buy X get Y for $9.99’ action of the Special Promotions extension, follow the instructions below. The ‘fixed price’ action implies that the ‘Y’ product is discounted to a fixed price and sold when the predefined ‘X’ ones are purchased. In this case, if a customer purchases 3 cameras, he/she can buy any camera tripod for just $100. How to configure the ‘Fixed Price: Buy X get Y for $9.99’ action? Besides, you can define SKUs of the individual products to which the discount should be applied (these are Y items as well). If you choose both categories and SKUs here, the discount will be applied for both items and products from the categories. Make sure ‘X’ items differ from ‘Y’ items. 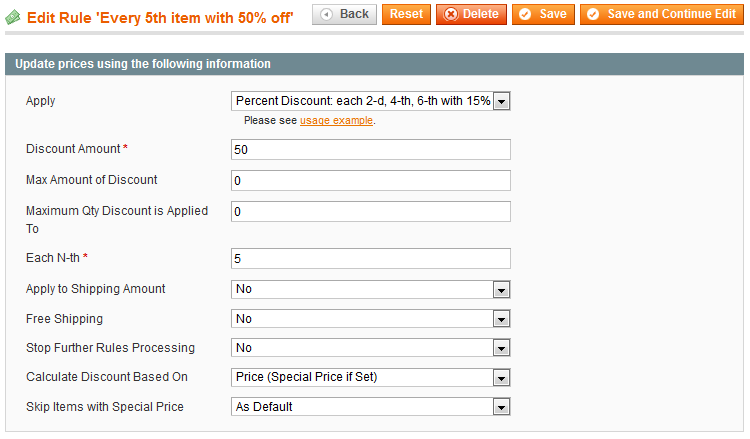 The guidance below shows how to use the action ‘Buy X Get N of Y with Percent Discount’ of Special Promotions extension. Thanks to this action you can create promotions like ‘Buy 3 phones and get 2 memory cards with 30% discount’. Step 1. Choose ‘Percent Discount: Buy X get Y Free’ for the ‘Apply’ field. 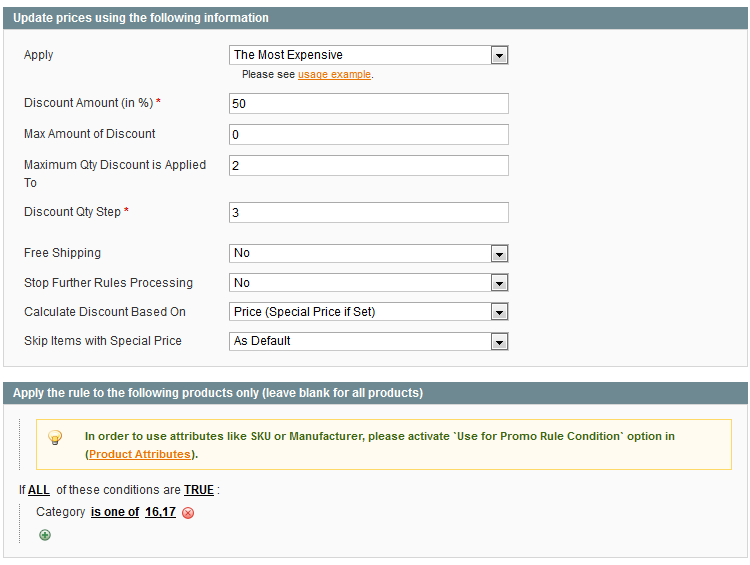 The guidance below shows how to configure the action ‘Fixed Price: Each 5 items for $50’ of Special Promotions extension. This action allows creating promotions like “Get group of special items for 150$”. Step 1. Choose ‘Fixed Price: Each 5 items for $50’ field. Step 2. Set the ‘Final Price For Group’. Step 3. 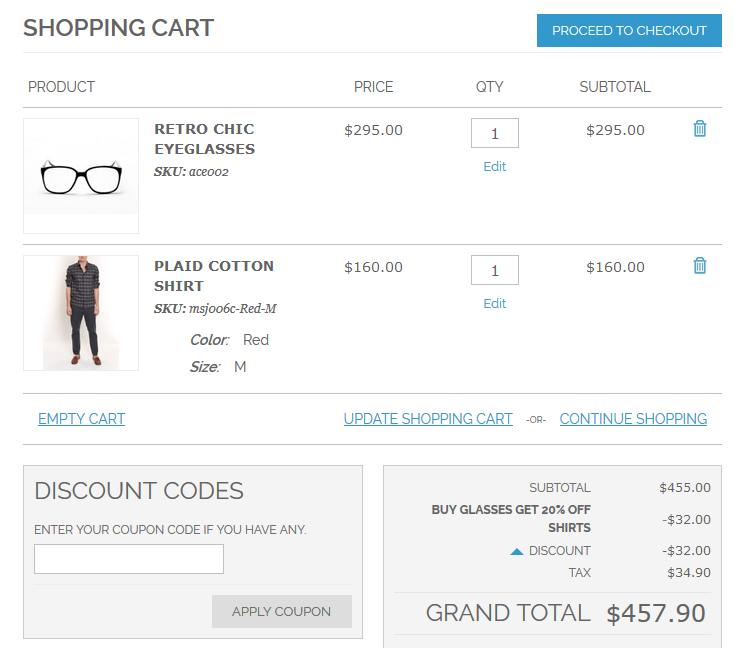 Use ‘Each Group of N’ field to indicate a discount step. If you indicate ‘4’ like below, it will mean that every group of four items will trigger the discount. Step 4. 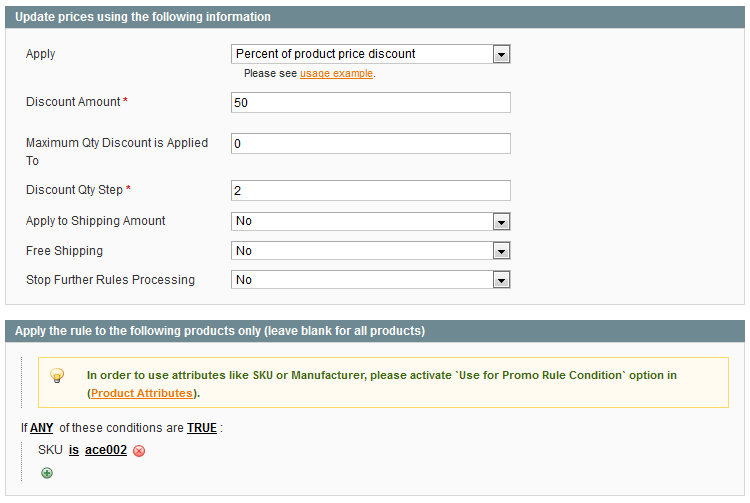 Also you can specify SKUs or categories of the individual products to which the discount should apply. The guidance below explains how to set up the action ‘Percent discount: each 5 items with 10% off’ of Special Promotions extension. This action enables you to offer a percent discount in case customer buy a specified number of items. Step 1. Choose ‘Percent discount: each 5 items with 10% off’ field. Step 2. Set the ‘Discount Amount (in %)’. The guidance below explains how to set up the rule ‘Fixed Discount: each 3-d, 6-th, 9-th with $15 off ’ of Special Promotions extension. ‘Each second (third, fourth, etc.) item $50 (100, 200, etc.) off ’. Let’s observe the steps of the rule configuration. Step 1.Choose ‘Fixed Discount: each 3-d, 6-th, 9-th with $15 off’ action for the ‘Apply’ field. Step 2. Use ‘Each N-th’ to specify a number of items a customer should buy to get a discount. Step 3. Specify the appropriate conditions for rule applying. If you would like to provide for free or discount items only from a certain category or of a particular brand, etc, please indicate the category, brand, other conditions here. And here's the result for the rule above. 1. All items that meet the rule are counted and sorted by price from highest to lowest. Let’s say you have three items that meet the rule. They cost $50, $70 and $30. The extension will create a list with such order: $70, $50, $30. 2. After that each n-th product from the list is discounted (or made free). 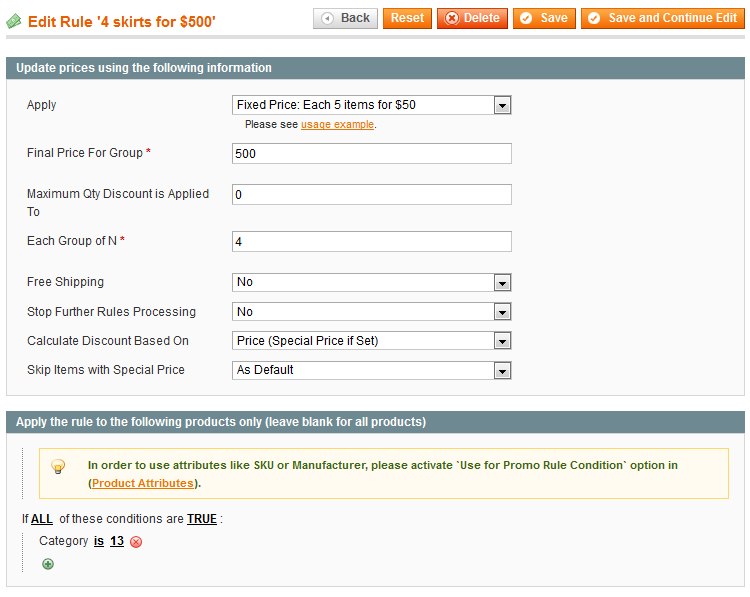 So if the rule is set as each third with $70 discount, in our case the $99 product is discounted by $70. The guidance below shows how to configure the action ‘Fixed Price: each 5th, 10th, 15th for $49’ of Special Promotions extension. The action lets you discount price of products to a fixed value (considering that the item meets the conditions of the price rule). 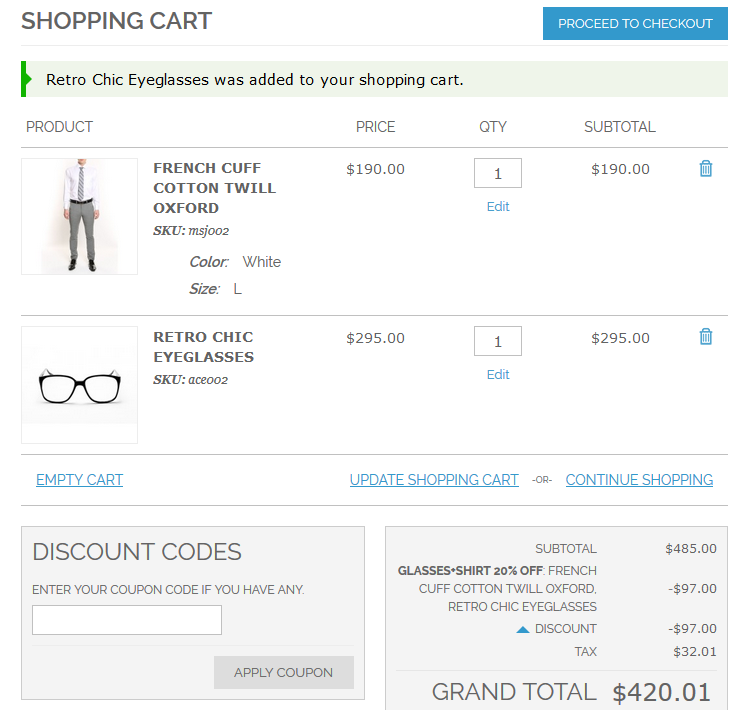 For example, if you have promotion ‘All contact lenses for $20’ or ‘Each second pair of jeans for $30’, you can create such promotions using this action. 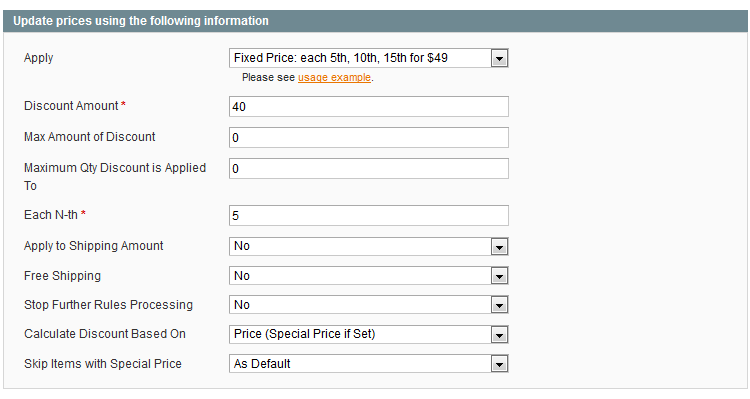 Step 1.Choose ‘Fixed Price: each 5th, 10th, 15th for $49’ action for the ‘Apply’ field. 2. After that each n-th product from the list is discounted (or made free). So if the rule is set as each second for $10, in our case the $50 product will discounted by $40 and get $10 price. The guide below explains how to set up the rule ‘Percent Discount: each 2-d, 4-th, 6-th with 15% off’ of Special Promotions extension. 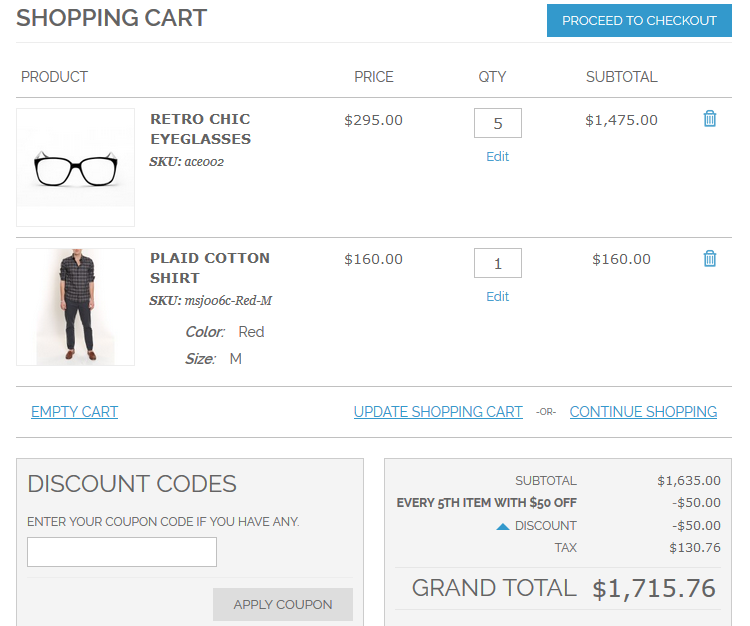 Step 1.Choose ‘Percent Discount: each 2-d, 4-th, 6-th with 15% off’ action for the ‘Apply’ field. 2. After that each n-th product from the list is discounted (or made free). 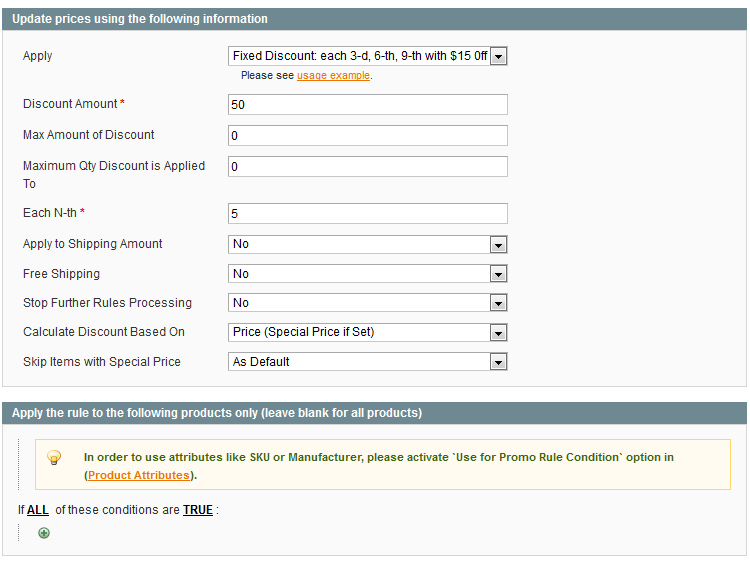 So if the rule is set as each second for 50% off, in our case the $50 product will discounted by 50%. Step 1. Step 1. 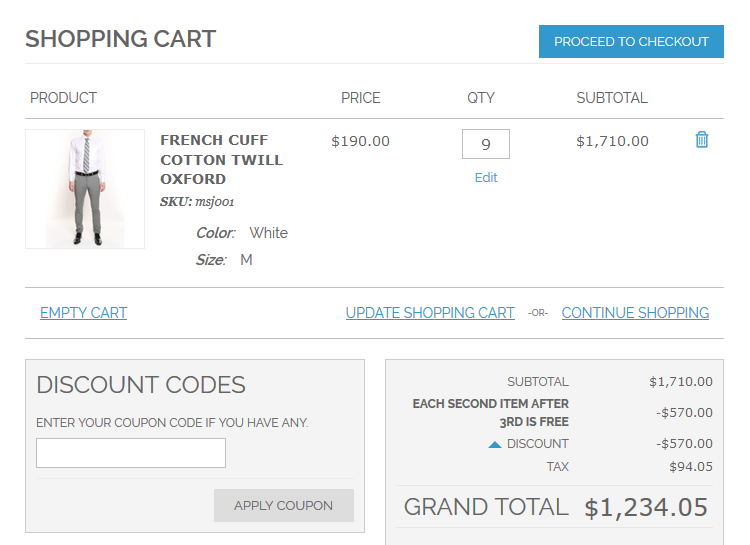 Choose ‘Fixed Discount: each 3d, 7th, 11th with $15 0ff after 5 items added to the cart’ field. Step 2. 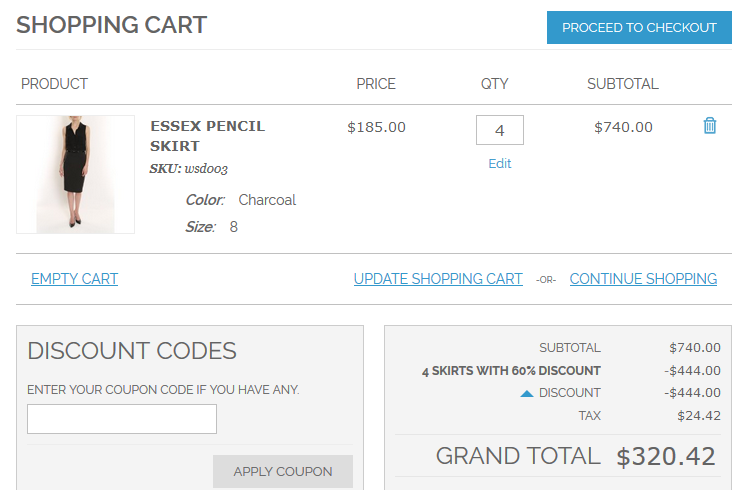 Use ‘Each Product (step)’ field to indicate a discount step. 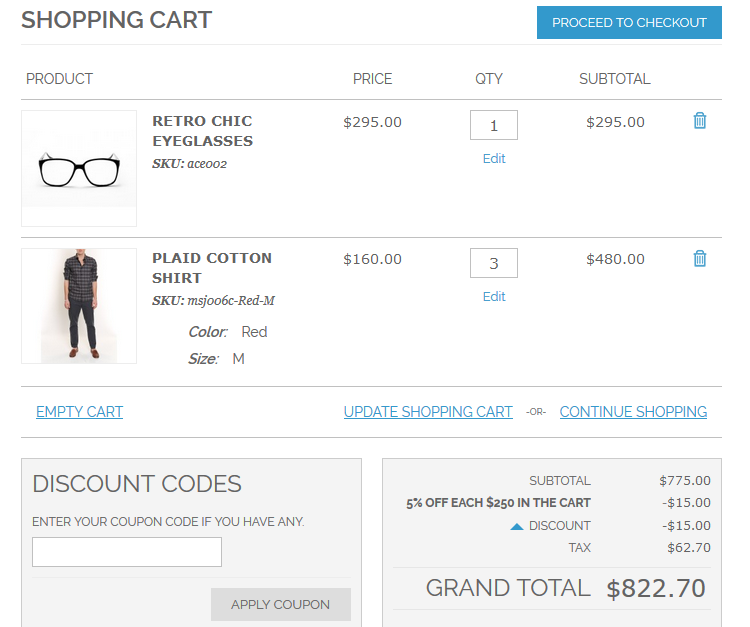 If you indicate ‘2’ like below, it means that each second item, that meets the rule conditions, will go with 20% discount. Step 3. Use ‘After N’ setting to indicate the number of ‘N’ items. If you specify 3 like here, it means that a customer will have to buy 3 ‘N’ items to get a 20% discount for the each second item, in this case for the 5th, 7th, 9th item and so on. The only difference of "Fixed Price: each 5th, 7th, 9th for $89.99 after 5 items added to the cart" action from "Percent Discount: each 1st, 3rd, 5th with 15% off after 5 items added to the cart" action is that instead of percent discount products are discounted to a fixed amount. Step 1. Step 1. Choose ‘Fixed Price: each 5th, 7th, 9th for $89.99 after 5 items added to the cart’ field. Step 1. Step 1. 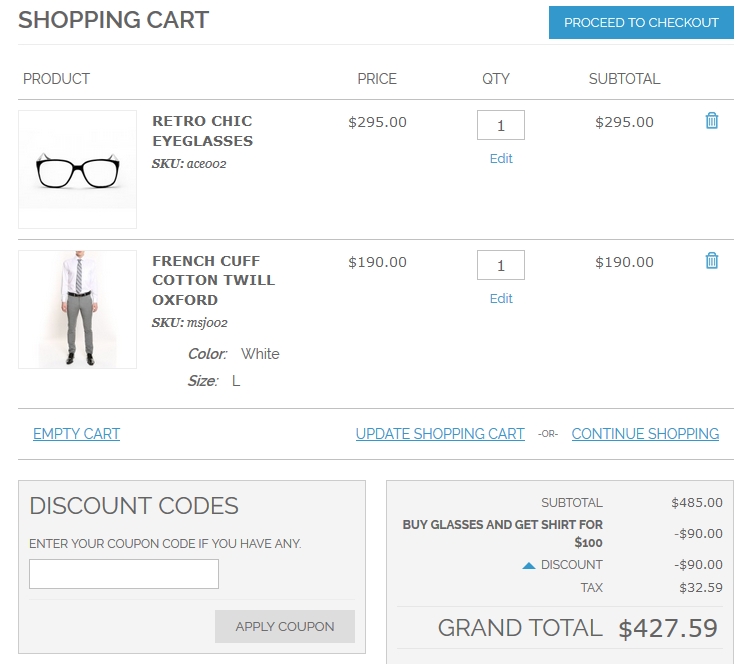 Choose ‘Percent Discount: each 1st, 3rd, 5th with 15% 0ff after 5 items added to the cart’ field. The guidance below explains how to set up the action ‘Get discount for each amount spent’ of Special Promotions extension. This action allows creating promotions like ‘Get $5 discount for each $250 spent’. Step 1. Choose ‘Get discount for each amount spent’ action for the ‘Apply’ field. Step 2. 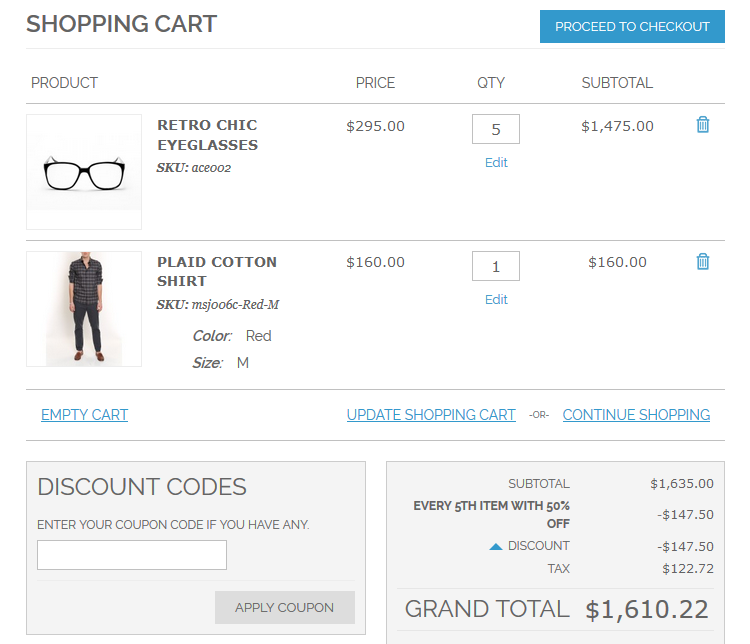 Set ‘Amount to Spend’ to determine the cart amount for which discount will be applied. Step 3. 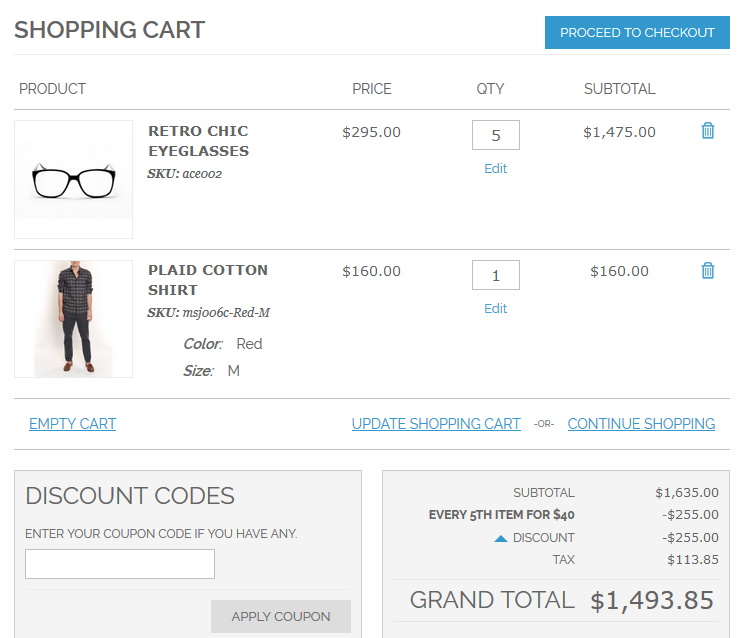 Use ‘Discount Amount’ field to specify the amount which will be taken off the cart total each time the amount in ‘Amount to Spend’ is reached. The rule below will get $5 off each $250, meaning that when subtotal reaches $500 the discount will be $10, for $750 in the cart the discount will be $15 and so on. The guidance below explains how to set up the action ‘Fixed Price for a Product Set’ of Special Promotions extension. This action enables you offer a fixed price for a particular product set. Step 1. Choose ‘Fixed price for product set’ action. Step 2. 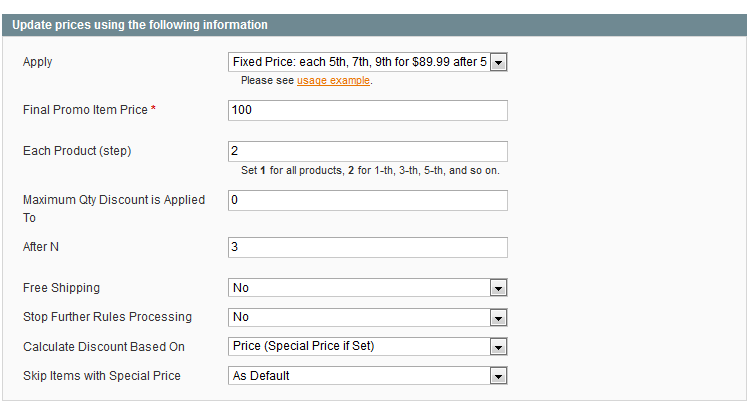 Use ‘Discount Amount’ field to specify the fixed price for the product set. Step 3. Specify SKUs or categories of products to which the rule should be applied. Step 4. Use ‘Discount Qty Step (Buy X)’ to specify the ‘X’ number. The discount step should be equal to the number of categories you’ve chosen for the promotion. The items we’ve added to cart meet the conditions we’ve specified in the Actions tab (see previous step), therefore the product set costs a fixed price $300 instead of $449. The guidance below explains how to set up the action ‘Percent discount for product set’ of Special Promotions extension. This action enables you to offer a percent discount for a particular product set. Step 1. Choose ‘Percent discount for product set’ field. Step 2. Specify SKUs of category IDs in the ‘Product Set’ fields. Here you define the set of products which will trigger the discount. The guidance below explains how the rule ‘The Most Expensive’ of Special Promotions works. - ‘Buy 6 get 2 the most expensive products for half the price’. Please note that customers will get discount for the items from the same categories only and they will never get discount for more than 2 items as the rule has ‘Maximum qty the discount applied to’ set to 2. Step 1. Choose ‘The Most Expensive’ action for the ‘Apply’ field. Step 2. Use ‘Discount amount’ field to indicate discount percent for the most expensive product. You can either leave it empty or type in 100 to give the most expensive item for free. Step 3. 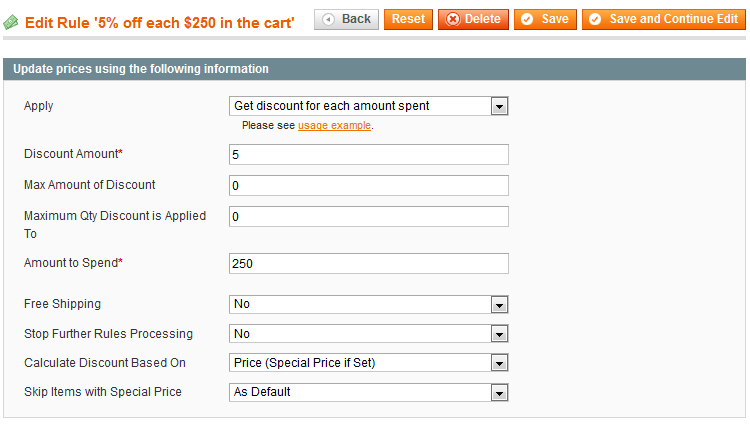 Use ‘Maximum Qty Discount is Applied To’ field to indicate maximum number of items for which the discount should apply. Leave it blank for no limitations. Step 4. Use ‘Discount Qty Step (Buy X)’ field to specify how many products customers need to buy for the rule to take effect. If you indicate 3 like here, that means that from every 3 items purchased customers will get 50% off for the most expensive one. If you leave ‘0’ (zero), customers will get only 1 free item per order (if conditions are met). Step 5. You can use all standard Magento conditions with the new actions. If you would like to provide for free or discount items only from a certain category or of a particular brand, etc, please indicate the category, brand, other conditions here. As you can see from the screenshot below, we have applied conditions to the 16th and 17th categories. Please see the example of the rule we've created above. I can not use special rules for admin orders. Please, log in to your account and download the latest extension version. I can't specify a percentage off defined products when ordering 10 items or more. If you use Product Promotions extension and can't set up a percentage off only defined products and only when a buyer ordered more then a specified number of items, please, perform the following instructions. Open Promotions→Shopping Cart Price Rules. Conditions: Set a condition that triggers the rule only if the cart contains 10 or more of SKU1 and/or SKU2 combined. 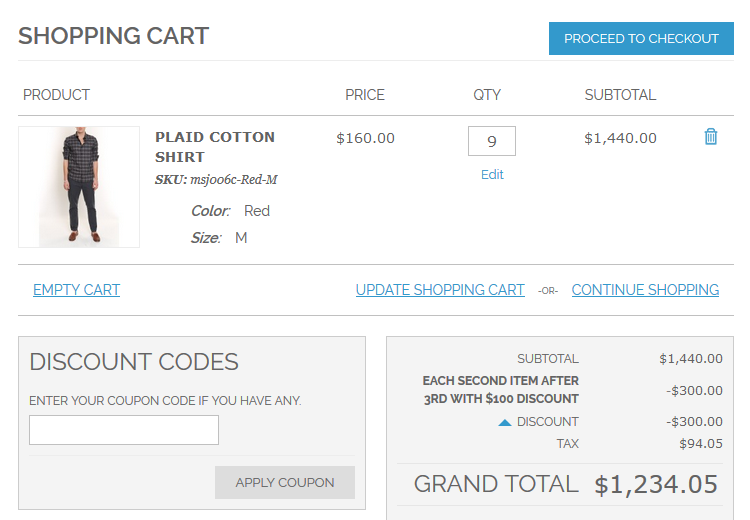 Actions: Set the actions to send a discount only in case SKU1 and/or SKU2 are in the cart. I see no discount breakdown. Do not forget to refresh the cache. This version of Magento have this line by default, so you can upgrade it freely. Special Promotions and Special Promotions Pro extensions require validation by category for associated simple products. It means that when you create a new rule, using any of our promotion extensions with condition based on "category", it is necessary to assign associated simple products to the same category(es) as their parent configurable products. So, open the Product Information page > Categories and check if the configurable product is assigned to a certain category. Then open Product Information page > Associated Products > Edit simple product, and repeat the same action, as shown on the screenshot above for the simple product. In other words, you need to assign the simple product to the same category. This validation helps you to avoid any possible issues during the checkout and payment steps and calculate the discount amount correctly. There is no SKU (or any other attribute) condition. If you can find some product attribute, like SKU or Manufacturer, in the conditions dropdown please, open admin > catalog > attributes > manage attributes > SKU, and set "Yes" for "Used for Promo Rules Conditions" option.